Sunday Brunch Hong Kong, best places for weekend brunches not to miss. Sunday brunches in Hong Kong have almost legendary status, and deservedly so. It’s easily one of the best ways to spend time with family or friends as you share a leisurely meal and enjoy a glass or three of a great drop. Here are some favourite weekend Hong Kong brunch places. If you are looking for a more up-market Sunday brunch in Hong Kong, The Clipper Lounge at the Mandarin Oriental is a sophisticated and cosy all-rounder. The food is very good, the choice of champagne is spot-on and if you’re a fan of lobster you will love it here. And did we mention the selection of 45 desserts? It’s also a nice choice for a date or a small and classy get-together with friends. If you are searching for the best brunch in Hong Kong for Japanese food, this Japanese restaurant offers a very decadent baikingu brunch. Upon arrival, you’ll be offered a choice of red or white wine, champagne or sake. You can then cruise the buffet loaded with exquisite Japanese dishes – think finest quality sushi, sashimi and other starters. Order a main course dish from the robata grill and then enjoy a Zuma dessert platter at the table. There is also a kids’ menu and a small play area suitable for babies and toddlers. Brunch is served in two-hour seatings. Aqua has two kitchens – one Japanese, the other Italian – and its weekend ‘Because Brunch’ menu features highlights of both cuisines. Enjoy exquisite sashimi and follow it up with an antipasti platter of 24 month-aged Parma ham, all while enjoying breathtaking views of Hong Kong. There’s also a play area for the under-5s set. The W Hong Kong does brunch through its KITCHEN restaurant, a particular hit with kids for its elaborate dessert station that includes cupcake-decorating kits and a chocolate fountain. The rest of the buffet brunch is equally as generous, with an array of dishes to please any palate. Saturday is ‘Family Day’, while Sunday is all about free-flow bubbles and seafood. If you fancy a Chinese brunch in Hong Kong, the award-winning Hutong offers great views and an impressive menu. The Feng Wei Brunch is a series of 18 sharing dishes served to the table and includes decadent dim sum and Northern Chinese dishes. 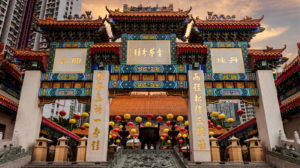 The weekend brunch also has a cultural element with a live classic Chinese performance – so it’s a great option to take visitors to showcase Hong Kong. The Pawn is a Wan Chai landmark, thanks to the distinctive Colonial style building in which it’s housed. The brunch menu has been refreshed in March 2019 and features shared starters, followed by a choice of mains including eggs Benedict on a pancake, English roast beef, quiche, pasta, mussels in creamy white wine sauce, and chicken skewers. Brunch ends with an unlimited dessert platter. There’s also a kids’ menu that includes milkshakes and smoothies, and a play area for younger kids so you can enjoy brunch in peace. For Italian fare, one of the best places for Sunday brunch in Hong Kong is this spacious and light-filled Tsim Sha Tsui restaurant which overlooks Victoria Harbour and is perfect for families, with its outdoor terrace a particularly good option for large groups. Spasso’s Gourmet Italian Brunch is a combination of buffet and à la carte mains. The free-flow package starts at an extra HK$168. The Italian and international cuisine on offer provide something for everyone, which is great when kids are in tow! Get ready to say Oui to Bibo’s new French weekend lunch experience. Bibo by Le Comptoir has a weekend lunch menu by Executive Chef Nicholas Chew. Art and food come together in this fine dining mecca that also serves as an installation space. Chef Chew has designed two seasonal menus with optional wine pairing and champagne free flow available on Saturdays and Sundays only. Wallet: Choose from “3 Steps” (from HK$438 + 10% for 1 Entrée, 1 Plat, 1 Dessert) and “5 Steps” (from HK$588 + 10% for 2 Entrees, 1 Plat, 2 Desserts). Choose from Bibo’s 3 wine pairings at HK$198 or 5 pairings at HK$388, or a champagne free flow experience at HK$388 per guest. La Rambla’s brunch experience includes premium Spanish products and authentic Spanish recipes with a modern twist. The best bit? Every Sunday, brunch is followed by an epic after party, complete with a live DJ on the open-air terrace. Wallet: HK$550+10% per guest +HK$350 per person for a free flow package that includes Veuve Clicquot Brut Rosé. You can choose to indulge in a premium free flow option that includes Krug Grande Cuvée NV, Belvedere, Grey Goose, Monkey 47 gin, Patron, Singleton 12 years and more. Want to hit more foodie haunts in Hong Kong? How about the city’s best ice-cream shops!